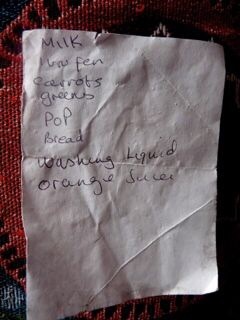 Milk, ibuprofen I presume, carrots, greens, PoP, bread, washing liquid, orange Suces? I am not sure on this last one, I can’t make out the word but I am sure it will be obvious when somebody points it out. Thank you again Southampton Old Lady! Yay! Another one. I reckon that could be orange juice. Yes, yes, yes. Easy no you say it! yes, I thought orange juice too.